Painted on acid-free cold press watercolor paper with all-natural watercolor pigments, accented with permanent inks. Paints, paper, and brushes were purchased from a locally-owned independent art supply store. Posters, prints, and cards available. These pieces were all created as table markers for the wedding between Roxanne and Comet James. Each location has special meaning to Comet and Roxanne, and the couple has the originals framed in their home. Hiking in the Columbia River Gorge is one of the first things Roxanne and Comet did to take advantage of the beautiful Pacific Northwest. They have been hiking with various friends throughout their time in the Portland area. Multnomah Falls drops in two major steps, with a total height of 620 feet. It is the tallest waterfall in the State of Oregon, and the third tallest year-round waterfall in the United States. The falls are fed by underground springs from Larch Mountain, and by snow and rainwater. The 45-foot long Benson Footbridge (named for and commissioned by Simon Benson in 1914) allows visitors to cross 105 feet above the lower cascade, and the trail continues to a platform at the top of the upper falls. In the third year of Comet and Roxanne’s courtship, they both attended the University of Oregon. It was a turning point in their relationship, because they both had left everyone they had known in California except each other, and were able to grow closer to one another. While at the University of Oregon, they worked at the Knight Library on campus, went out to brunch together often, and met many good friends, including their good friend Hillary Stanley. The University of Oregon is a public research university founded in 1876. The Knight Library is the main facility in the library system. The architecture of the library reflects the design of the university’s older buildings, and serves as a hub of student activity. Manzanita is one of the couple’s favorite places along the Oregon Coast. It represents great memories of close camp friends spending time together outside of the Portland area. Holly “Deneb” Maunu hosts cozy weekends of board games and walks along the beach and through the cute coastal town to the favorite local coffee shop, Manzanita News & Espresso. Manzanita is a coastal town in Tillamook County, halfway between Tillamook and Seaside. The beach at Manzanita is bordered to the North by Neah-Kah-Nie Mountain. A hiking trail leads to the top of the mountain for incredible views of the Pacific Ocean. Manzanita is sandwiched between Oswald West State Park and Bay State Park. Comet and Roxanne visited Rocky Mountain National Park on their first road trip together (of many) with Jill “Jilla Gorilla” Begin, and it was instrumental in their realization that they both enjoyed exploring outdoorsy places together. Part of this road trip also included Roxanne meeting important members of Comet’s family for the first time. Rocky Mountain National Park includes over 150,000 acres of land in Colorado, with 359 miles of hiking trails, and a quarter of the park lies above the tree line. During Comet and Roxanne’s first visit to Camp Namanu, they ate lunch in one of the Balagan treehouses overlooking the Sandy River, which solidified a strong first impression of the beauty of the camp. The two acquired an appreciation of the incredible traditions of Camp Namanu at their first dream boat ceremony on the shores of the Sandy River. Roxanne and Comet often spend time off from camp on the beach. Camp Namanu is a summer camp on the Sandy River, founded in 1924, and operated by Camp Fire USA. This view is of the confluence of the Sandy River and Walker Creek, and the rocky cliff on the opposite shore. Once per summer at Camp Namanu, the campers and staff congregate to release small boats made of natural materials bearing lit candles, to carry their dreams into the night. The Sandy River is a 56-mile tributary of the Columbia River. It discharges an average of 2,300 cubic feet per second, and joins the Columbia 14 miles upstream of Portland. For their 3rd anniversary, one more piece in the collection was commissioned by Roxanne. 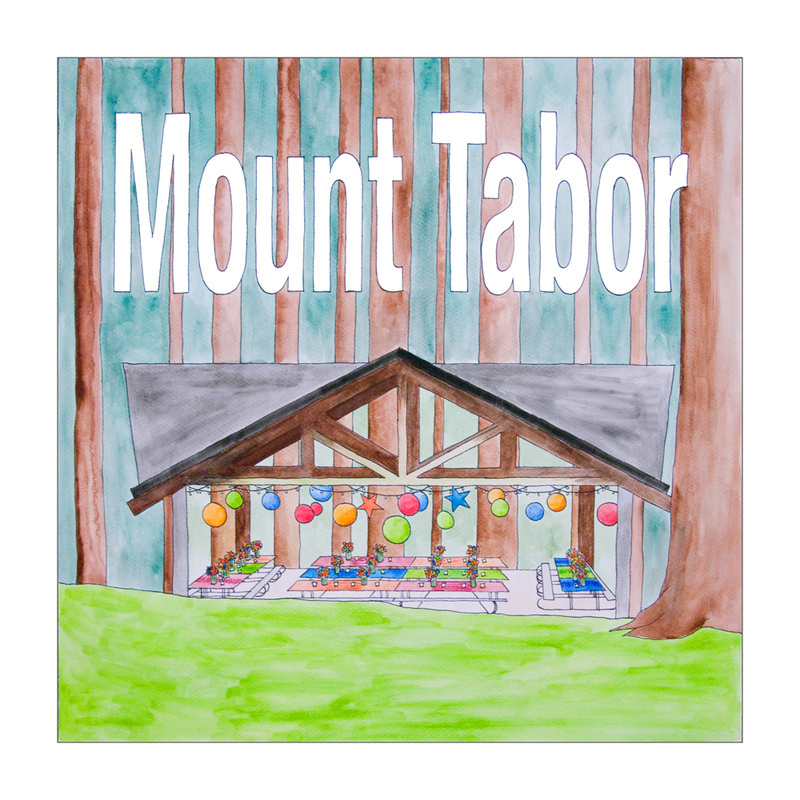 Mount Tabor, the site of their rainy, but unabashedly colorful wedding occupies an important place in the hearts of the couple. This design is larger and square in format, to serve as a centerpiece for the collection. Mount Tabor is a city park in Southeast Portland, Oregon, situated on an extinct volcano. The peak is 636 feet in elevation, and the 196-acre park was the largest Portland Park until Forest Park was created in 1947. Disneyland has special meaning for Roxanne and Comet. It was the site of their first date, their first Christmas together, their first anniversary, their engagement, and soon to be their honeymoon. Main Street in Disneyland is one of their favorite parts. Each evening in Disneyland ends with the couple on Main Street, getting ice cream from the Gibson Girl Ice Cream Parlor and watching cartoons at the Main Street Cinema. Main Street, USA is the first “land” a visitor to Disneyland encounters. It is designed to resemble the heart of a turn-of-the-century American town. Above the firehouse is the personal apartment of Walt Disney. A lamp burns in the front window of the apartment in his memory. The Blue Bayou was already Roxanne’s favorite restaurant, but it was made more meaningful many times over. It was the first restaurant the couple went to on their first date in Disneyland, and it was the restaurant in which Comet asked Roxanne to marry him. Roxanne and Comet have three reservations at the Blue Bayou throughout their honeymoon. They love the Cajun food and the décor; it is always night time at the Blue Bayou’s outdoor seating area, and cool air, festive lanterns, fireflies, and croaking frogs help to set the mood. The Blue Bayou in Disneyland opened in 1967 in response to criticisms of the food quality in the park. New Orleans Cajun-style food and unusual ambiance make this restaurant a must-visit for Disneyland patrons. A dark, distant ceiling, air conditioning, and coordinated sound and lighting work together to create the effect of an outdoor restaurant at night. The trails of Sanborn Park are used by participants at Walden West, so Roxanne and Comet know them well. For their first anniversary, the couple stayed at the hostel in Sanborn Park, and spent the day reading Harry Potter and the Half-Blood Prince aloud to each other whilst picnicking in a circle of redwood trees. Comet and Roxanne also enjoyed several Shakespeare performances on the outdoor stage in Sanborn Park. They were particularly impressed by the graveyard scene in Hamlet that included digging into the actual ground at the park. Sanborn Park is located in the Santa Cruz Mountains, and hosts the only outdoor Shakespearean company in Silicon Valley. Towering redwood trees make Sanborn Park one of the coolest summer climates of Santa Clara County’s parks. Other park flora include Coast live oak, Pacific madrone, Bigleaf maple, and Tanbark oak. Shady Shakespeare Theatre Company is committed to making Shakespeare accessible to people of all ages and backgrounds and to building community through cultural participation. Their mission is to share the works of William Shakespeare in a way that demystifies the rich and challenging language of Shakespeare without dumbing it down. They produce two free-to-the-public plays each summer. The Sanborn Park Hostel was a beautiful historic log house among the redwoods, which served as a friendly stopover for backpackers, travelers, bicyclists, youth groups, and students on field trips. After a wonderful 30 year run, the hostel recently closed its doors. Roxanne and Comet spent time in Santa Cruz with friends from Walden West on their nights off and vacations from camp. They always stopped at the Saturn Café, spent some time on the Santa Cruz Beach Boardwalk, and finished off the day with ice cream from Marianne’s. The Saturn Café’s progressive business practices include preparing food in a health-conscious manner, using biodegradable products, buying local and organic food, becoming certified as a Green Business, and serving exclusively vegetarian fare to reduce global warming emissions from raising livestock. The are also proud to be anti-war, pro gay marriage, in favor of raising the minimum wage, and are committed to being active participants in their community and donate to local non-profits. Marianne's Ice cream is known for its dancing cow wallpaper, and having over 70 flavors at any given point. These flavors come served in bowls, 3 types of cones, or in a variety of sundaes. Sodas and shakes are also available. The Santa Cruz Beach Boardwalk is an oceanfront amusement park founded in 1907. The Giant Dipper roller coaster is one of the best-known wooden coasters in the world, and is on the US National Register of Historic Places. Cathedral is one of the locations that represents Camp Namanu best for Comet and Roxanne. One of the more picturesque locales in camp (amongst hundreds of acres of beautiful northwest forest), Cathedral was the site of an amusing anniversary prank (by Comet, on Roxanne), and the wedding of Kate “Vista” and Jenna “Newt” Guertin-Davis, at which Roxanne and Comet were members of the wedding party. Camp Namanu is a summer camp on the Sandy River, founded in 1924, and operated by Camp Fire USA. Cathedral is the primary location for weekly and ceremonial camp fire programs at the camp, and contains seating for up to 275 people. The raised, square fire pit at Cathedral was built by Gary “Flame” Taylor as his Eagle Scout Project. Flame built the raised pit because he remembered being unable to see the fire from behind other people as a small camper. Comet and Roxanne met at Walden West, where they had both been cabin leaders for the outdoor school program, and counselors for the summer camp program, but never together (though they had heard about each other through friends prior to meeting). Walden West represents the couple’s first youth working experiences, and influenced their current career paths. Walden West's Outdoor Science School program serves fifth and sixth graders living and learning in an outdoor setting through hands-on activities. Walden West's Summer Day Camp program serves children ages 7-12. The meadow at Walden West is a place with fond memories for Roxanne and Comet. Through the years, they have enjoyed stargazing and meteor showers in the meadow, and it is one of the prettiest places at Walden West. One evening, while singing Stand By Me at the conclusion of a night hike with Jymn “Scooby” Meier, the two saw the same shooting star streak across the sky (and, of course, each made a wish about the other). Roxanne, Comet and a group of their Walden West friends slept out on the meadow the night of their Senior Prom. Walden West’s Outdoor Science School program serves fifth and sixth graders living and learning in an outdoor setting through hands-on activities. Walden West’s Summer Day Camp program serves children ages 7-12. At Walden West Summer Camp, Thursday nights are a special time. Parents arrive for a barbeque and raffle, and the campers participate in night hikes and sleep overnight in the meadow. Comet was into the Berkeley punk rock scene for a while before he met Roxanne. In fact, Comet didn’t go to high school, he went to Amoeba Music. Comet went to his first concert at the Gilman, and he was excited to share his favorite Berkeley haunts with Roxanne, who was also into punk rock. The two went to many shows at the Gilman together, including the Groovy Ghoulies, Jason Webley, Joel’s Birthday and the Punk Rock Prom. The 924 Gilman Street Project is a non-profit, all-ages music club, usually referred to as “The Gilman.” The 924 Gilman Street Project has a no drugs, no alcohol, no violence policy, and membership (available for a $2 annual fee) includes the ability to make decisions for the club and work toward its improvement. The club supports a DIY ethic, and will not book bands who are signed to a major label, or whose lyrics include racist, misogynistic, or anti-homosexual material. Amoeba Music is an independent chain with locations in the Bay Area and Southern California. Amoeba was founded on Telegraph Avenue in 1990 by former employees of Rasputin Records. Amoeba stores are unusually large for independent music stores. Fat Slice dishes up thick slices covered with toppings – just the thing to hit the spot after shopping for music in downtown Berkeley. Roxanne and Comet’s first time in Portland included tickets to see Of Montreal (as a birthday surprise from Roxanne to Comet) at the Crystal Ballroom. The two later spent time exploring Portland’s independent bookstores on Burnside, and these early trips to Portland encouraged them to eventually move to the Rose City. Powell’s City of Books is a chain of independent bookstores around the Portland Metropolitan Area, the flagship of which occupies a full city block. Powell’s Books contains 1.6 acres of retail floor space with more than 4 million new, used, rare, and out-of-print books. Powell’s buys 3000 used books per day. Reading Frenzy, founded in 1994, is an independent press emporium / specialty bookshop / gallery devoted to supporting alternative media and culture. Reading Frenzy stocks hundreds of hard to find books and hosts dozens of literary and art events annually. Built in 1914 originally as Cotillion Hall, the Crystal Ballroom has hosted popular jazz, blues, rock, folk, and pop artists, as well as beat poets and other entertainment starting in the 1960s. The Portland Streetcar system opened in 2001 as a single line, and now serves 12,000 riders daily. The Portland Streetcars are maintained and operated by TriMet, but owned by the city of Portland.